With the rise of Donald Trump, there’s certain things that have become almost laughable to believe. Here’s seven. Are you kidding me? Donald Trump is on every channel. More people support Bernie Sanders than Donald Trump, yet ABC news devoted 234 total network minutes to Donald Trump compared to just 10 network minutes for Bernie Sanders. 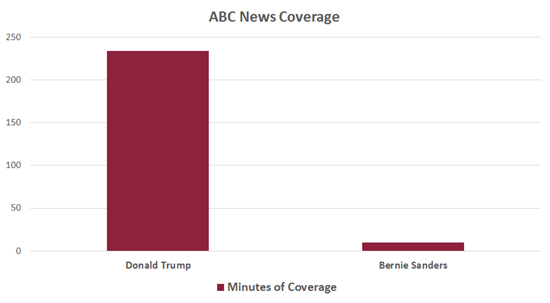 Relative nightly news coverage on ABC: Trump vs. Bernie. 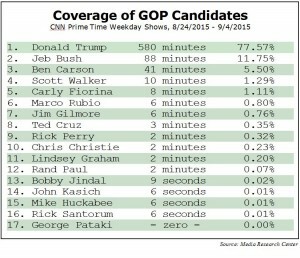 Or for that matter, where’s the coverage of the other GOP candidates? You know, on television, on FOX and CNN, they call it all Trump all the time. Can you believe it? All Trump all the time. And by the way, their ratings are through the roof. If they weren’t, they wouldn’t put me on. I`ll be honest with you. It’s a simple formula in entertainment and television. If you get good ratings — if you get good ratings — and these aren`t good, these are monster — then you’ll be on all the time, even if you have nothing to say. If you come up with a cure for a major, major horrendous disease and if you don`t get ratings, they won`t bother even reporting it. It`s very simple business. Very simple. 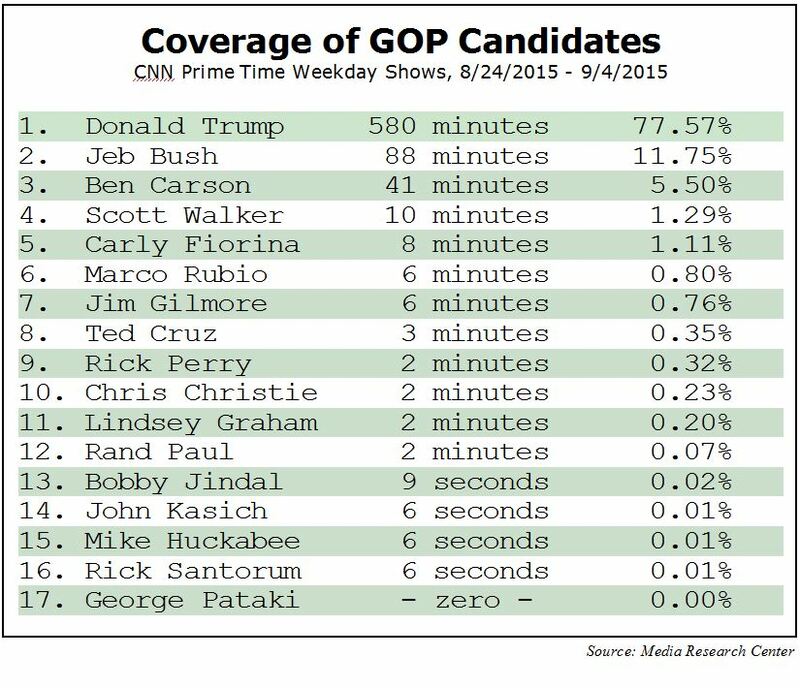 There is no “liberal media.” It’s about the money. Q: You’ve also supported a host of other liberal policies, you’ve also donated to several Democratic candidates, Hillary Clinton included, Nancy Pelosi. You explained away those donations saying you did that to get business related favors. And you said recently, quote, when you give, they do whatever the hell you want them to do. TRUMP: You better believe it… I will tell you that our system is broken. I gave to many people. Before this, before two months ago, I was a businessman. I give to everybody. When they call, I give. And you know what? When I need something from them, two years later, three years later, I call them. They are there for me. And that’s a broken system. ?This should be shocking. What Trump is talking about is bribery. Since the Citizens United decision in 2010, we’re seeing an increase in money in politics to the point that our system is no longer even recognizable from 10-15 years ago. Money in politics is a YUGE problem. 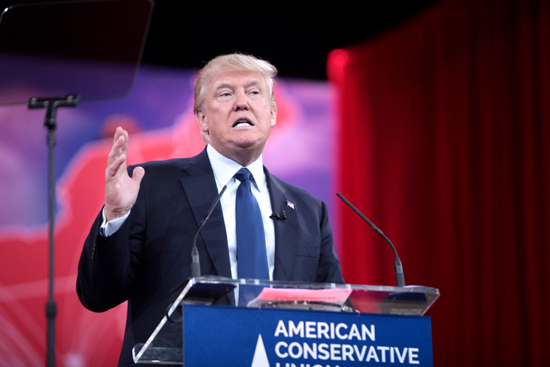 Donald Trump’s positions on people who don’t like him are wildly popular within the GOP base. In other words, Trump is blaming an entire religion for the actions of a few. This is the equivalent of blaming all Christians for the actions of the Planned Parenthood shooter. Never mind that Mexicans aren’t really coming here anymore now that we’ve moved so many factories to Mexico. Too bad we didn’t have a wall to keep the factories in? 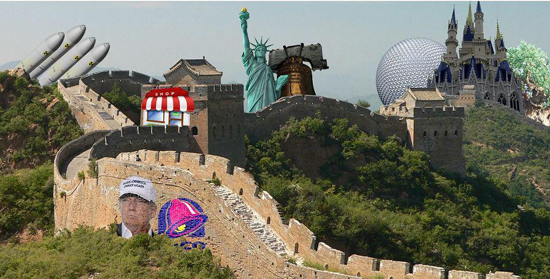 The great wall of Trump? The sad truth is that globalization, technology, and government capture are really what’s hurting so many Americans. To hide this though, apparently all you have to do is tell people that it’s someone else’s fault. If it’s not Muslims, it’s immigrants. If it’s not immigrants, it’s blacks. If it’s not blacks, it’s gays. If it’s not gays, it’s atheists. If it’s not atheists, it’s women. If it’s not women, it’s liberals. If it’s not liberals, it’s Obama. If it’s not Obama, it’s the government. Whew! Thank god we know who to scapegoat. 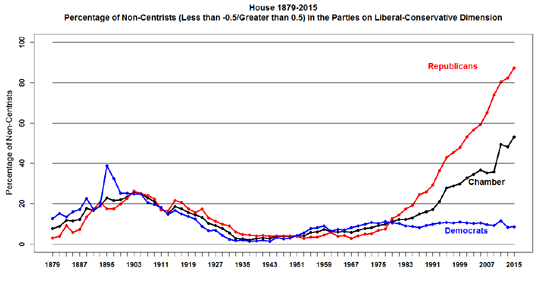 Only one party has grown more extreme since the 1980s. Percentage of non-centrists over time. Devin Nunes, a Republican Congressman from California, spoke about how difficult it’s become dealing with his base in an interview with the New Yorker. Everything is a government false flag operation. I’ve talked to people who believe that we would have free energy if the government weren’t covering up a secret invention of Nikola Tesla’s. I’ve had people swear up and down that Fox News is “liberal.” The GOP base reads people like Frank Gaffney at Breitbart. And Daneen Peterson. Their prophets are dead cult leaders like Ayn Rand. Obama’s a Muslim and wasn’t born in the U.S.
Alex Jones, on the other hand, has over 2 million listeners. His website gets over 4 million hits a month. The other difference is that no politician on the left believes 9/11 was an inside job. They all think it’s a conspiracy theory because it is a conspiracy theory. Politicians on the right are a different story. Ted Cruz and Donald Trump both admire Frank Gaffney. Rand Paul believes in the Bilderberg group and believed in the North American Union until it started making him look whacky. Here’s Donald Trump on Alex Jones saying: “Your reputation’s amazing. I will not let you down. ?”I get the anger people are feeling about losing their jobs and having to do more and more to earn less and less, but I’m pretty sure NASA didn’t fake the moon landings, Obama’s not sending anyone to concentration camps, and gay people aren’t trying to take over the world. This is the modern-day GOP though. 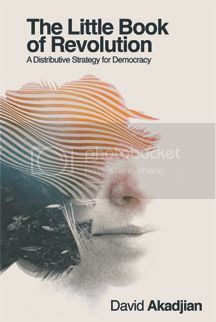 Its base is extraordinarily reactive, anti-government, anti-democratic, anti-reason, and anti-science. When we elect people who believe in these kind of conspiracies, why should we be surprised that government is a giant clusterf*ck? If we want better government, a good first step would be to stop electing people who think everything is a government conspiracy. Remember when we were all told it’s about family values? The family values I see with Donald Trump are selfishness and power and fear. This has been the case for some time now with the GOP; it’s just never been so out in the open. Much of the base believes in Ayn Rand, a philosophy that advocates selfishness as the only virtue. There is no room in her philosophy for any of the above. Trump is Ayn Rand personified. A guy who succeeded because he started with money who thinks that it was somehow because of him and his genius. 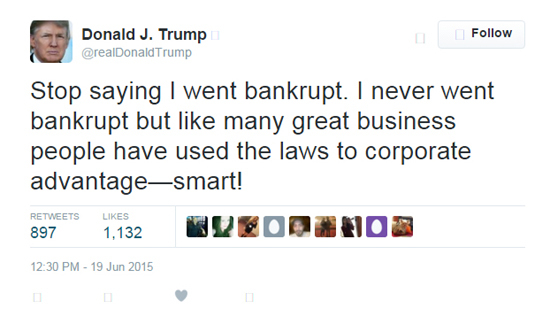 Trump believes it’s personally great when laws help him recover from bankruptcy. And it’s not just Trump. It’s all the other Republican politicians clamoring for more handouts and tax cuts for the rich and less pay and benefits for everyone else. Apparently, the quickest way to campaign donations is to find the nearest billionaire. Though I’m not Christian, I agree with Christians that the country is suffering a serious values crisis. It’s not because of liberals though (or gays or immigrants or blacks or Muslims or atheists or Jews or women or “socialists”). Between 2015-2016, according to the Forbes list, the top 14 people saw their wealth increase by $157 billion. That’s increase. Not total. $157 billion is more wealth than the bottom 40% of Americans own. We’re seeing massive redistribution of wealth. Upward. If somehow these 14 people were delivering a better tomorrow for our country, maybe, just maybe, I could see this excessive upward redistribution as moral. But it sure looks like they’re just making people more poor. Many are also buying political influence over our democracy. Our traditional values are being wiped out by a small few who seem to care about nothing more than increasing what they have. I long for the days when our business leaders had Christian values of fairness and mutual responsibility and we operated on principles other than profit. No matter how many times we see it, we still tend to think that giving people more data will somehow help them make better decisions. As much as we’d like to believe this, politics is about emotion and morals. People feel that there is a right way and a wrong way to do things and they want their politicians to believe what they believe. We like people who look like us. We also tend to like people who we feel are not trying to manipulate us. It’s true for everyone though. We vote on personalities and whether we like someone. And whether we like someone often has to do with whether we see them as moral or not and whether they look or act like us. This is why it’s so important to talk about values in your personal conversations about politics. Values tend to unite us while beliefs tend to divide us. Back in September, I heard an interview with a Trump supporter who was a cabinet maker. All he talked about was how he couldn’t make what he used to anymore and how excited he was that Mr. Trump was running. I make less money than I made 15 years ago because we’re – I’m competing against IKEA and all this cheap stuff. I’ve taken a beating. Donald Trump has slightly more twitter followers than Hillary Clinton at over 5 million. With no media coverage, Bernie Sanders has over 1 million. 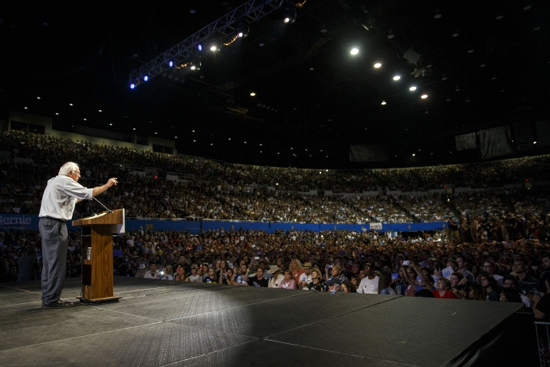 Bernie Sanders at a rally in Los Angeles. Photo courtesy of Peter Stevens. People are angry because they don’t see things getting better in their personal lives. They’re working harder and harder for less and less money. Populists on both “sides” are angry at establishment candidates. While the media focuses on Trump’s outrageous comments, the anger is real and the anger is about the economy. Liberals seem to be hedging their bets that the Republican Party will implode one way or another. I think this is a dangerous proposition since they have a story about the economy (it needs to be “freed”) that goes largely unchallenged. Aren’t markets without rules black markets? Isn’t “free” just clever marketing by the people who stand most to benefit? If we hope to do better, we need to talk about how people can do better and what this would look like. There is no less or more regulation. There is no “free” market. There’s just rules for the economy. If there were no government at all, there would still be rules for the economy. They would simply be written by the most powerful – those with the most money. In other words, in the absence of government, the default government is the rich. 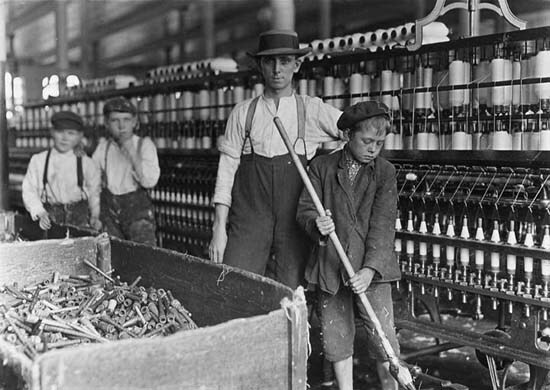 There were times in our history, for example, when coal companies forced people to shop at company stores and we believed in child labor. Markets didn’t end these practices. People did. 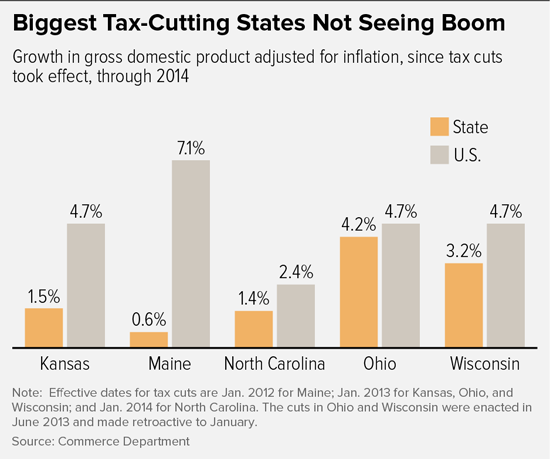 Especially when data from state after state show that these handouts simply hurt local economies and juice Wall Street. The way the economy should work is that people, both consumers and business owners, should work together to write the rules so that they’re fair and so they benefit more people. Democracy is needed for a working economy. Checks and balances are needed on markets or a powerful few tend to monopolize them. Right now the rules are being written by the most powerful to benefit a wealthy few. In a world that’s proposing Donald Trump as our leader, we need democracy more than ever. Government doesn’t “intrude on” or “pervert” markets. Government creates markets. This simple fact is why you see so many corporate special interest groups. Corporations want government to create the rules in their favor. They’re not in Washington arguing in favor of less government. They’re in Washington lobbying for a different government, one in which the rules favor them. Our choices are clear. We can create markets so they benefit a few. Or we can create more moral markets.